Mike Maloney mentioned an economist he was studying as part of his research for a new book, so I ordered one of his books. The core message in this economist’s book pulls no punches: There is no escaping another debt-related crisis. And while he doesn’t specifically state the crisis will be worse than the Great Depression, the data he shares and conclusions he draws make that clear. The book is Can We Avoid Another Financial Crisis? by Steve Keen, Professor of Economics at Kingston University in the UK. For those who follow economic theories, he is closely associated with the beliefs of Hyman Minsky, who some credit as providing the best explanations of the causes of financial crises. It’s hard to do much financial reading these days without running into an article on debt. While most analysts reference public or government debt, Mr. Keen says that history shows it is private debt that is the real culprit. Consider why this is true. A government or central bank can print money or tinker with interest rates to deal with their debt load. The private sector can’t do these things, so their options to escape debt are very limited and thus tend to have a greater drag on an economy. 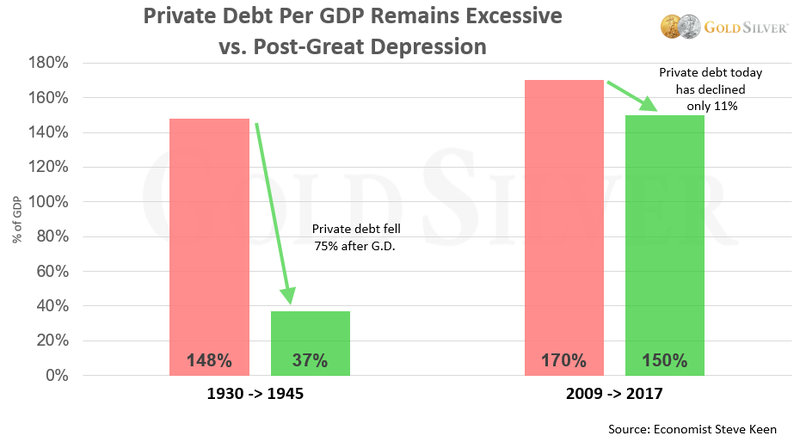 Private debt today has declined only marginally since the crisis in 2008/09, especially when compared to the greatest financial crisis in US history. In fact, it’s higher now than it was before the Great Depression. We’ve kicked the can so far down the road (the first option) that it’s become a cliché. Those of you that follow Mike Maloney know he is emphatic that you can’t kick the can forever and that as a result there is no way to avoid another crisis. And of course, it’s not just private debt. 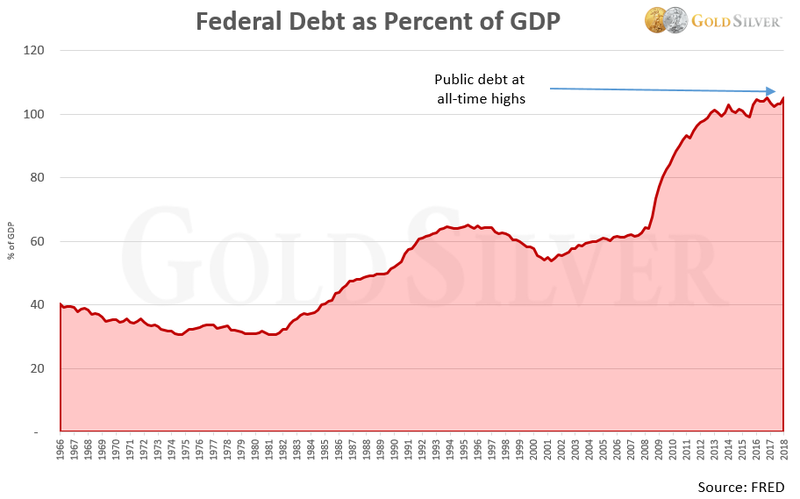 US government debt, as a percent of GDP, is now higher than it has ever been. The US government has more debt than the country’s annual economic output. You can see that historically this has not been the case for many decades. Worse, there is every sign that government debt will continue to grow. The US Treasury just reported that it expects to issue $329 billion in net marketable debt this quarter (July-September), $56 billion more than what they estimated in April. 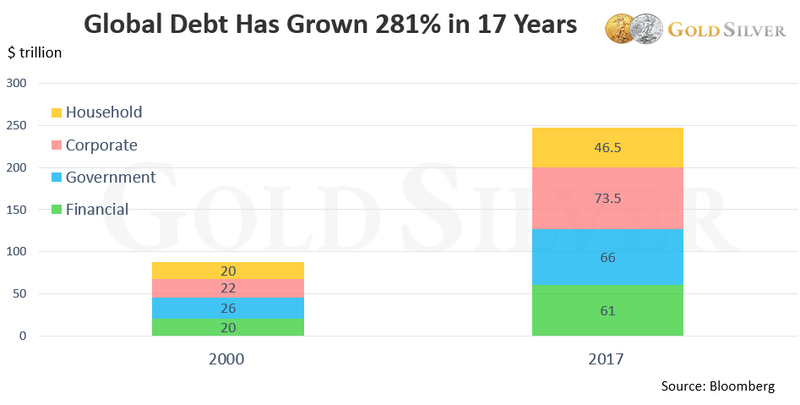 And when you tally the debt load around the world, it’s staggering to realize just how much it has grown this millennium. Total global debt has almost quadrupled in just 17 years. Even though we haven’t had a financial crisis in almost a decade now, history is very clear on this point: the higher the governmental debt, the more financial shocks a country experiences. With debt in virtually all categories at record highs today, the number and intensity of financial shocks headed our way is likely to be life-changing. This is a clear signal to be overweight precious metals. The second reason the upcoming crisis will potentially be worse than the Great Depression is because it will affect virtually the entire planet. The second category are countries he classifies as future Debt Zombies. What this tells us is that if he’s correct, then there will be very few places to hide. It will involve every developed country, at least 18 nations in all and as many as 26. Will he be right? You’ll notice that he basically has the same diagnosis — and prognosis — as Mike: it will be one of the biggest financial crises in history. Friends, don’t get discouraged by flat gold and silver prices. No matter what kind of crisis is ahead, they will protect you financially, as well as provide you a tremendous opportunity.